Chart-topping children’s composer and author Doctor Noize brings lively and inspirational works of musical theatre to the stage that inspire creativity, curiosity and character in young audiences. Our goal at the Children’s Theatre is to present stories that engage our audiences. We are honored to collaborate with a composer of Cullinan’s experience, imagination, and musical skill directing his talents toward fostering new work for young audiences. Every Doctor Noize recording is a work of musical theatre, and the Doc's become a sought-after musical theatre composer. Palo Alto Children’s Theatre commissioned a theatrical stage musical The Ballad Of Phineas McBoof based on the first two Doctor Noize albums and books, the Ballad and Return Of Phineas McBoof. The result -- a stage show about music, purpose and friendship that inspires audiences of all ages to listen more deeply and consider their own musical creativity -- is available in both Full and Junior Versions, and can be performed by adult or kid casts. The successful run of The Ballad quickly lead to four more stage musical commissions: A modern reimagining of Sleeping Beauty, adaptations of Doctor Noize's own Grammaropolis and the New York Times bestselling book The Pout-Pout Fish, and East of the Sun, West of the Moon. Plus, Phineas McBoof Crashes the Symphony — with glowing reviews nationwide — is available for production by ambitious musical theatre and opera houses. Join the growing list of organizations who commission Doctor Noize for an entirely new show! Or... Contact to Premiere or Commission a New Theatrical Production! As my own kids have become increasingly involved in musical theatre productions, I've become more fascinated with bringing my works theatrically to the stage. It allows me to connect with my past as a teacher and Music Director for shows like Into The Woods. Musical theatre is a wonderful creative outlet for kids to perform and watch alike, and a delightful medium to write and compose for. It feels like coming home. Time: 9:00am. The Doc rocks Utah with the Easter Bunny! Doctor Noize will be playing shows and MC’ing this event. We’ll all do The Bunny Hop. Time: 10:00am. Set #2 on Bunny Weekend. Time: 10:35am. The final show of Bunny Weekend. Mic Drop for the DN, Carrot Drop for the EB. Time: 3:30pm. Doctor Noize will be performing music from his upcoming stage musical “Grammaropolis” to be premiered in CA! Time: 2:00pm. Doctor Noize visits Kaycee for the very first time for an Unplugged Show! Time: 10:30am. They say this place is all Wright. Come sing along at an Unplugged Show! Time: 1:30pm. Summer reading Unplugged Show #1! Time: 3:00pm. Summer reading Unplugged Show #2! Time: 9:30am. An Unplugged Show for the preschoolers of Johnson County! Time: 11:00am. An Unplugged Show for K-2 kids in Johnson County. Time: 2:30pm. An Unplugged Show for grades 3-5 kids in Johnson County. Time: 6:30pm. An evening Unplugged Show in Campbell County! Time: 10:00am. A special performance for the Kids Camp at the County Recreation Center. Time: 2:00pm. A chance to rock out with the Campbell County Boys & Girls Club. Join The Club! Time: 10:00am. Doctor Noize returns to Anderson Park as the debut performer at their new beautiful pavilion theater! An amplified acoustic rocker of a show. Time: 11:00am. The Doc returns to Boulder for an Unplugged Show! Time: 2:30pm. An Unplugged Show in Denver. Time: 10:00am. *Private Event* The Doc returns to rock the Rec! Time: 1:00pm. The Doc returns for a series of full Doctor Noize Live! shows at one of his favorite libraries in the country! Time: 3:00pm. Full Doctor Noize Live! Show #2 at Natrona. Time: 10:00am. *Private Event* A full Live! show at the Boys & Girls Club — always a wild and energy-packed gig. Time: 1:00pm. More full Doctor Noize Live! sets at Casper’s most popular kids’ entertainment venue. Time: 3:00pm. Party on, Casper! Time: 10:30am. Day 3! More full Doctor Noize Live! shows. The crowds and community in Casper are awesome. Time: 1:00pm. All good things must pass, and this is the last Doctor Noize Live! show of NatronaFest 2019… Rock on, Casper. Time: 3:30pm. *Private Event* The Doc’s final show in Casper is his only Unplugged Show of the trip. A nice mellow way to close out the series. Time: 1:00pm. Unplugged in Denver. Time: 1:00pm. The Doc returns for an Unplugged Show at one of his favorite Denver metro libraries! Time: 10:00am. The Doc returns to Parker! Time: 6:30pm. Doctor Noize returns for a “Reading Is Fun” celebration and show! And this time it’s a full Doctor Noize Live! show, with all the instruments and loop recording gizmos. The pizza place in this town is THE BEST. Time: 12:30pm. *Private Event* A Songwriting & Recording Workshop for Lusk students with Doctor Noize before the big show in Lusk that evening! Time: 6:00pm. Doctor Noize plays Platte County for the first time — dinner at 5:30 and showtime at 6! Time: 11:00am. *Private Show* Doctor Noize plays for the students of one of his former high school students, Nana Romero — who is now a fantastic elementary school teacher! Time: 10:30am. The Doc returns to the beautiful Botanic Gardens for another winter show. Time: 4:00pm. The Doc plays a very special Unplugged Show in honor of a very special girl who’s one of Doctor Noize’s heroes. Time: 4:00pm. One more Doctor Noize Live! set in sunny Flagstaff… with a holiday song or two thrown in. Time: 11:00am. A holiday music show to Celebrate The Sounds Of The Season in Arizona. We’re kicking off the Winter holidays early! Time: 2:00pm. The Pout-Pout Fish hits the road! Doctor Noize himself will NOT be at this event, but his musical will be performed at a new venue as the show hits the road! Send the Doc pics if you go!!! Time: 3:30pm. Doctor Noize Live! Second Show. Time: 2:00pm. Doctor Noize Live! One of the Doc’s favorite museums in the world. “Write & Record A Hit Song With Doctor Noize!” Workshop. Event produced in conjunction with the premiere of “The Pout-Pout Fish” musical, based on the New York Times bestselling book with music by Doctor Noize as composer. Time and registration info TBA! The world premiere of the new musical “The Pout-Pout Fish”, based on the New York Times bestselling book with music by Doctor Noize. Both composer Doctor Noize and author Deborah Diesen will be in attendance! Time and ticket info TBA. *Private Event* Sponsor & Donor Meet & Greet Dinner. Supporters of the world premiere musical “The Pout-Pout Fish”, with music by Doctor Noize and based on the New York Times bestselling book of the same name, will enjoy a dinner and reception with the author, composer, cast and producers of the show! Details TBA. Time: 7:00pm. Doctor Noize will be one of the first acts to play the beautiful new Howards Grove Center For The Arts in WI in October. The show will kick off the premiere weekend of the “The Pout-Pout Fish” musical, based on the New York Times bestselling book with music by Doctor Noize as composer. Ticket info TBA! Time: 7:00pm. The Doc plays Michigan at this fantastically funky venue! Time: 11:00am. The Doc is honored to be celebrating the 125th year of the Hotel Colorado — the premiere historic hotel and meeting venue in this famous Rocky Mountain locale and a cultural icon. The Doc headlines the family entertainment during the day, but stick around as Doc’s friend and Colorado legend Chris Daniels and his amazing band play the adult evening show! Day 2 Show #1. Time TBA. Day 2 Show #2. Rock on. Time TBA. Doctor Noize returns to the wonderful Willow Tree Festival for two days of shows! Saturday Show #2. Time TBA. Time: 5:00pm. The Doc returns for another full Doctor Noize Live! Show. Time: 11:00am. Doctor Noize returns to one of his fave venues — the Strings Music Festival in Steamboat Springs — where many a legendary musician has performed. Time: 4:00pm. Unplugged Show & Book Reading! Time: 1:00pm. Last afternoon in Wyoming. Time: 10:00am. Day 3 in Wyoming! Time: 3:30pm. Wanna take you to the… YMCA!!! Time: 3:30pm. Come rock with the Doc. Time: 1:00pm. One of the Doc’s favorite libraries! The staff here is totally committed to bringing quality programming to their kids and families. Time: 10:00am. *Private Event* The Doc returns to play a series of shows for kids in one of his favorite towns in middle America, Casper. Doctor Noize is at Reach Studios writing books and scores for three stage musical theatre commissions — Sleeping Beauty, Grammaropolis, and The Pout-Pout Fish. See you this summer! Time: 12:00pm. *Private Event* Set 3 of Anadarko’s Holiday Party — a full Doctor Noize Live! Show. Time: 11:00am. *Private Event* Set 2 of Anadarko’s Holiday Party — a full Doctor Noize Live! Show. Time: 10:00am. *Private Event* Set 1 of Anadarko’s Holiday Party — a full Doctor Noize Live! Show. Time: 2:00pm. The Doc returns to Smoky Hill for an Unplugged Show. Time: 2:00pm. The Doc returns to Koelbel for an Unplugged Show. Time: 4:45pm. *Private Event* The Doc’s seventh and final event at Google this year. Happy Googleween! Time: 3:30pm. *Private Event* The Googleween festivities continue! Time: 9:15am. *Private Event* Doctor Noize is THRILLED to play an assembly show at his elementary school alma mater, Santa Rita School in Los Altos, CA! Can’t wait. Time: 4:45pm. *Private Event* Happy Googleween! The Doc’s 4th show and 5th event (the other was a keynote talk) of the year at one of the world’s great tech companies. Time: 3:30pm. *Private Event* The Doc returns to one of his favorite companies, Google, for Googleween! Come see a performance of the 11-show run of Palo Alto Children’s Theatre’s “East of the Sun and West of the Moon.” Doctor Noize is composing the music and working with the cast on the performance. The Doc will be in attendance on opening night, October 26th! Time: 11:00am. *Private Event* Doctor Noize returns to the school he once taught at for a Doctor Noize Live! assembly show! Doctor Noize returns to Palo Alto Children’s Theatre right before his Stanford reunion to work with the cast on “East of the Sun and West of the Moon,” which he’s composing the music for. Time: 10:30am. Dr. Noize returns to Springfield, MO — where he played Symphony Shows to 5,000 kids a few years ago and had a holiday special on the local CBS station — to play an Unplugged Show at the local library! Time: 1:30pm. *Private Event* A Doctor Noize Unplugged Assembly Show. Time: 10:30am. Today’s second Unplugged Show for the late risers and double-show-goers! Time: 9:30am. The first of two 30-minute Unplugged Shows today at this beautiful library. Time: 6:00pm. Unplugged Show. Doctor Noize’s first show in Columbia, Missouri! Doctor Noize once again teams up with the wonderful Palo Alto Children’s Theatre, this time to compose the music and work with the performers on the stage show “East of the Sun and West of the Moon.” The Doc will attend the first days of rehearsal in September. Time: 10:00am. The Doc’s honored to be invited to give a Keynote Address & introduction to his work & purpose for to the Colorado State Music Teachers Association’s “Local Association Of The Year.” A meeting of like minds. Time: 1:00pm. The second of the Doc’s Unplugged Shows at A Taste Of Colorado, Colorado’s Big Bash right at the Capital that draws more than 500,000 visitors every year! Time: 10:45am. The Doc plays two Unplugged Shows at A Taste Of Colorado, Colorado’s Big Bash right at the Capital that draws more than 500,000 visitors every year! Time: 3:00pm. The Doc returns to this amazing little town for a full Doctor Noize Live! show. Time: 12:00pm. The Doc returns to one of his favorite Rocky Mountain getaway venues this summer for a full Doctor Noize Live! show! Details TBA, but the show’s at noon. Time: 4:15pm. Unplugged Show #4 Today! Time: 2:30pm. Unplugged Show #3 today! Time: 12:00pm. Unplugged Show #2 today! Time: 10:15am. The first of FOUR Unplugged Shows today at the Festival! Time: 4:00pm. Show #2 at one of the Doc’s fave festivals! Bring the kids for music, fun, rides and games. Time: 7:00pm. The Doc returns to one of his favorite tour cities for a full Live! show. At the concert, we’ll perform the song we wrote and recorded that very morning at a Doctor Noize Genius Camp with the awesome kids of Whitewater! Time: 10:00am. Doctor Noize leads a Genius Camp Song Workshop of Whitewater kids this morning. We’ll write and record a song together. Then we’ll debut the song in the evening at the Whitewater Summer Concert Series! Time: 10:00am. Doctor Noize Live! closes out the summer concert season for Wheat Ridge’s Performances In The Park series. Time: 6:00pm. Doctor Noize joins Purple Fox & The Heebie Jeebies for a kids music festival. A full Doctor Noize Live! set will be played — including the premiere of a Genius Camp song Doctor Noize is writing with Bay Area kids earlier in the week! The Doc will also sit in with Purple Fox for a song or two. Time: 12:00pm. The Doc returns to one of his favorite outdoor amphitheater venues for a full Doctor Noize Live! show. Time: 7:15pm. Set 2! Play and sing! Time: 6:30pm. Set 1! Doctor Noize plays an event for the first time for this Foundation that makes amazing playgrounds accessible to all kids. Regardless of ability, disability, size or age, everyone plays at Magical Bridge. Come see the playground and hear one or both sets of music! Time: 4:00pm. Genius Camp Workshop: “Create A Hit Song With Doctor Noize!” Genius Camp Kids will be writing and recording a song with Doctor Noize, and then PERFORMING it onstage with him live at the festival concert in Palo Alto on Saturday night! SO COOL. Camp is $75. Spend a few days writing, recording and performing for an audience with Doctor Noize! Details and signup link TBA. Time: 7:10pm. Doctor Noize and the Song Workshop Kids will perform our just-composed workshop song –along with other great entertainment — during the night’s final performance. Time: 6:00pm. A Genius Camp Song Workshop follows the show! Doctor Noize will write and record a song with the kids, and then we’ll perform it together at the end of the evening. Time: 5:00pm. Full Doctor Noize Live! show at this beautiful place! Time: 3:00pm. See you next time, Wyoming! Time: 1:00pm. Last afternoon of Wyoming shows! Time: 10:00am. A full “Doctor Noize Live!” show. Time: 1:00pm. A full “Doctor Noize Live!” show at one of the coolest library district’s on the Doc’s regular tour circuit. Time: 10:00am. The Doc returns this year to the Boys & Girls Club in Wyoming. Time: 3:00pm. Doctor Noize returns this year for another Unplugged Show and Book Reading at Mills. Time: 1:00pm. A full Doctor Noize Live! show at one of the coolest library systems Doctor Noize plays on his regular tour route. Time: 10:00am. Doctor Noize tours returns to the Casper YMCA again this year! Time: 10:00am. Unplugged Show at a great library in one of the Doc’s favorite towns! Time: 2:00pm. Doctor Noize Live! returns to the Thornton Funtaztikidz series. *Private Event* Doctor Noize is honored to be an invited guest of the Renaissance Weekend, where he will perform shows and serve as both a moderator and panelist on areas of interest in culture and the arts with leaders of many fields. And the Doc’s family gets to come share in all the learning and inspiration too! Time: 1:30pm. A second day, a second Unplugged Show at beautiful Copper Mountain resort. Details and exact time TBA! Time: 1:30pm. An Unplugged Show at beautiful Copper Mountain resort. Details and exact time TBA! Time: 10:00am. The Doc returns to this great library for another Unplugged Show! Time: 12:45pm. Doctor Noize Live! Show #2 of Aurora’s Summer In The City Series! Time: 11:15am. Doctor Noize kicks off Aurora’s Summer In The City Series with two hour-long Doctor Noize Live! shows. Here’s show #1. Time: 4:00pm. Doctor Noize joins some of the world’s most acclaimed children’s musical theatre composers to perform each other’s songs at the One Theatre World Song Slam. We’ll perform a song from the Doc’s new musical “The Ballad of Phineas McBoof,” Deborah Wicks LaPuma’s latest hit musical, and many more songs from many more great shows! Time: 10:45am. *Private Event* A second day, a second show at one of the Doc’s favorite places for Take Your Child To Work Day! Time: 8:45am. *Private Event* Doctor Noize returns to Google land — one of his favorite companies in the world — to play a full “Doctor Noize Live!” show for families there. If you don’t know what Google is, Google it. Time: 1:00pm. *Private Event! * Keynote Address for ADULTS! The Doc is honored to receive an invitation to speak to some of the smartest people in the world at Google. He’s been asked to speak about the intersection of creativity, commerce and technology — something Google clearly knows about. So the Doc is SUPER EXCITED to hear the Google audience’s comments in the Q&A section of this keynote — he’ll probably learn more than he teaches. Time: 6:30pm. The Doc returns to this amazing little town for another Unplugged Show with one of the best audiences in the country. Great pizza place too. Can’t wait! Time: 10:30am. Doctor Noize Live! at the gorgeous Denver Botanic Gardens for a special event open to the public. Time: 8:30pm. The second of two Doctor Noize Live! shows on New Year’s Eve in the hip college town of Fort Collins. Enter the venue and head to Eagle Room 1! Time: 7:45pm. The first of two Doctor Noize Live! shows on New Year’s Eve in the hip college town of Fort Collins. Enter the venue and head to Eagle Room 1! Time: 2:00pm. 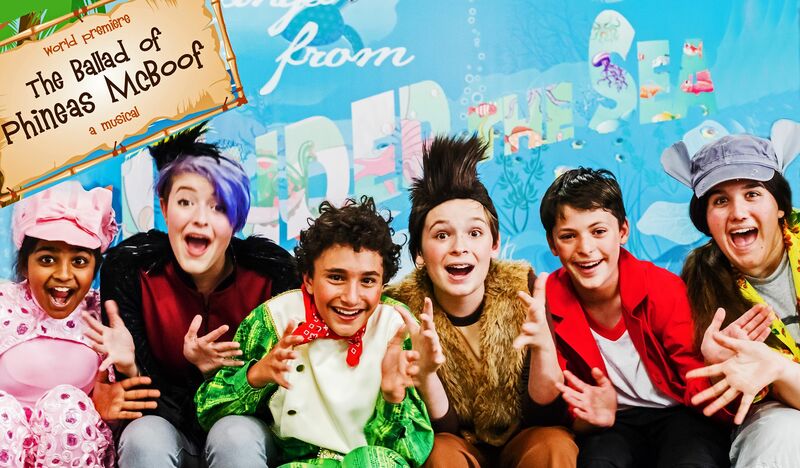 Come to the World Premiere of the theatrical stage production of “The Ballad Of Phineas McBoof!” Commissioned by the Palo Alto Children’s Theatre and starring a cast of amazing KIDS, this new musical is based on the first two Doctor Noize albums and books. Bananas! Time: 7:00pm. Come to the World Premiere of the theatrical stage production of “The Ballad Of Phineas McBoof!” Commissioned by the Palo Alto Children’s Theatre and starring a cast of amazing KIDS, this new musical is based on the first two Doctor Noize albums and books. Bananas! Time: 4:30pm. Come to the World Premiere of the theatrical stage production of “The Ballad Of Phineas McBoof!” Commissioned by the Palo Alto Children’s Theatre and starring a cast of amazing KIDS, this new musical is based on the first two Doctor Noize albums and books. Bananas! Time: 7:00pm. The Doc rocks the Zoo’s “Washed Ashore Beach Party” celebrating the grand opening of the new “Washed Ashore — Art To Save The Sea” exhibit. Make music with Doctor Noize and meet sculptor Angela Haseltine Pozzi, lead artist of the exhibit, for a truly multimedia experience. Time: 12:00pm. RECORD RELEASE SHOW! The Doc returns to play songs from the new “Phineas McBoof Crashes The Symphony” and headline the kids’ stage at the amazing NewWestFest. Free concerts, food, and much more! Watch the show and then spend the day. Time: 1:00pm. RECORD RELEASE SHOW! Come celebrate the release of “Phineas McBoof Crashes The Symphony” at Parker’s summer Concerts In The Park series. Also performing (and joining Dr. Noize for a song) is the Doc’s friend and Colorado’s own children’s music legend Katherine Dines! Time: 10:00am. Unplugged Show & Book Reading supporting the release of “Phineas McBoof Crashes The Symphony”! Come for a scaled down event and get the new album after! Time: 3:00pm. RECORD RELEASE PARTY! The City Of Palo Alto hosts the Bay Area Record Release Party for “Phineas McBoof Crashes The Symphony!” It’s a FREE Doctor Noize concert, theatrical premiere of a documentary MADE BY KIDS on the album’s production, and a chance to share drinks and snacks and discuss the album with Doctor Noize. Come celebrate bringing the orchestra and musical theatre to kids with Doctor Noize and many of the supporters who made this adventurous album possible! Time: 10:00am. Unplugged Show & Book Reading in Doctor Noize’s hometown of Los Altos, CA on the release day of “Phineas McBoof Crashes The Symphony”! Come for a scaled down event downtown and get the new album after! Time: 12:00pm. RECORD RELEASE SHOW! The Doc returns to San Jose to rock Woz’s museum, one of his favorite places!!! Come to the show and get the new album after! Time: 6:30pm. RECORD RELEASE SHOW! Doctor Noize returns to the CityCenter Amphitheatre to celebrate the release of “Phineas McBoof Crashes The Symphony” and the 15th year of Englewood’s great summer KidStage series! Come to the free concert and get Doctor Noize’s new album after! Time: 6:30pm. Doctor Noize kicks off his Spring return to playing shows with an Unplugged Show & Book Reading in Wyoming! Doctor Noize is wrapping up his longest touring break ever as he finishes production of the Symphony album, construction of Reach Studios, and commissions for Grammaropolis and Palo Alto Children’s Theatre. He’ll return to his regular performance schedule this Spring! Doctor Noize is taking a tour break to focus on completing “Phineas McBoof Crashes The Symphony” and developing educational curriculums to go with his albums and books. See you back onstage soon! Time: 10:30am. *Private Event* Assembly Show #2 at McGraw Elementary! Time: 9:30am. *Private Event* Assembly Show #1 at McGraw Elementary! Time: 2:10pm. A final set at Nebraska’s Willow Tree Festival! Time: 11:25am. Day 2 of Nebraska’s Willow Tree Festival! Time: 1:00pm. A second Nebraska show at the Willow Tree Festival! Time: 10:00am. The Doc plays Nebraska for the first time at the Willow Tree Festival! Time: 2:20pm. A second assembly show in Nebraska! Time: 8:30am. An assembly show for Doctor Noize’s first performance in Nebraska! Time: 4:00pm. Set #2 at New West Fest! Time: 2:00pm. The Doc returns to Ft. Collins’ biggest music festival! Sets at this festival are SHORT, so don’t be late! Time: 9:30am. Doctor Noize plays a free public show at Clement Park for the City of Littleton! Time: 7:00pm. Doctor Noize returns to his home turf for one of his favorite outdoor summer show settings of the year! I always look forward to seeing friends here. Time: 12:00pm. Doctor Noize returns to Woz’s awesome Silicon Valley museum for kids! Time: 2:00pm. Last Wyoming show! Time: 1:00pm. Final day of Wyoming shows! Time: 10:00am. The Doc returns to the Casper Recreation Center. Time: 3:00pm. Acoustic Show at Mills Branch! Time: 1:00pm. Day 2 in Natrona County! Time: 10:00am. *Private Show* Doctor Noize returns to the Boys & Girls Club. Time: 1:00pm. Doctor Noize returns to Wyoming! Time: 10:00am. *Private Show* Assembly show for Verda James! Time: 10:30am. Doctor Noize returns to this wonderful venue in this wonderful city! Time: 12:15am. The Doc returns to Windsor again for the annual Bookmobile Day! Time: 12:15pm. *Private Event* Grades K-3 Songwriting Workshop! Time: 10:00am. *Private Event* Doctor Noize Live! Show. Full K-8 School Assembly in the Amphitheatre where “Phineas McBoof Crashes The Symphony” premiered. Time: 9:00am. •Private Event! * 8th Grade Orchestral Music Workshop at the school where “Phineas McBoof Crashes The Symphony” premiered! Time: 8:15am. •Private Event! * 7th Grade Orchestral Music Workshop at the school where “Phineas McBoof Crashes The Symphony” premiered! Doctor Noize returns to Redding School of the Arts — where the initial version of “Phineas McBoof Crashes The Symphony” was premiered — for a day of workshops, music and fun. Time: 10:00am. •Private Event• Doctor Noize conducts a songwriting and recording Workshop with some very special Noizemakers in the city where he was once a music teacher and arts department head! Doctor Noize is taking a touring break to focus on production of “Phineas McBoof Crashes The Symphony” at Reach and other studios around the country. See you on the road again soon! Doctor Noize is taking a performing break to focus on production of “Phineas McBoof Crashes The Symphony.” See you onstage soon! Time: 1:00pm. A second orchestral show with the Springfield Symphony! Time: 10:30am. Doctor Noize performs orchestral shows with the wonderful Springfield Symphony under the baton of Maestro Kyle Pickett! Time: 3:30pm. *Private Show* Doctor Noize rocks the Googleween party with his friends at Google — maybe you’ve heard of it. Nothing like rocking the Googleplex a day before the Doc’s birthday and two days before Halloween! Frightening!!! Time: 2:30pm. *Private Event* Doctor Noize celebrates this great school’s 40th anniversary with this second of two assembly shows. Time: 1:30pm. *Private Event* Doctor Noize celebrates this great school’s 40th anniversary with this first of two assembly shows. Time: 11:00am. A second full Doctor Noize Live! show for the Seedlings series. Time: 9:30am. A full Dr. Noize Live! show for the Seedlings series in one of the Doc’s favorite venues. Time: 4:00pm. Set #2! Shows here are quick (20-30 minutes), and there are rides, games, food and music booths all over. Tons of adult bands too! Time: 1:00pm. The Doc returns to this massive music fest for two fun shows! Shows here are quick (20-30 minutes), and there are rides, games, food and music booths all over. Tons of adult bands too! Time: 11:00am. Doctor Noize returns to this exceptionally beautiful venue in Steamboat Strings! Time: 7:00pm. Doctor Noize returns again to the summer Whitewater concert series! One of his favorite homes away from home. He’ll perform and premiere the song written with Whitewater kids in the Songwriting Workshop earlier that day. A Song Workshop for the kids of Whitewater! Dr. Noize and the kids will write and record a song together during the day, and premiere and perform the song together at the summer concert the same night! TTBD. Time: 10:00am. *Private Show* An Unplugged Show for the Lawton Taylor Academy to close out their big Music focus this summer! Time: 2:00pm. The Doc returns to the beautiful Englewood Library for an Unplugged Show this summer! Time: 7:00pm. Special Show at Rinconada Park! Doctor Noize returns home for another awesome annual outdoor concert. The Doc will premiere AND RECORD WITH THE AUDIENCE a new anthem that will be featured in his upcoming album “Phineas McBoof Crashes The Symphony.” Don’t miss it! Time: 11:00am. Doctor Noize performs at a private, personalized house concert in his hometown Los Altos. If you’re in the Bay Area and would like to attend, click on the link and RSVP! Time: 12:00pm. The Doc rocks The Playhouse That Woz Built again! Come for a full Live! show in the heart of Silicon Valley. Time: 3:00pm. Second show of the day at the Main Branch. Time: 1:00pm. First show of the day at the Main Branch. Time: 10:00am. Doctor Noize returns for the second year in a row! Time: 3:00pm. An Unplugged Show at this small but sweet Natrona County Library branch. Time: 1:00pm. Another Live! Show. Time: 10:00am. The Doc returns for a second year! Time: 3:00pm. Second show at the Main Branch today! Time: 1:00pm. Doctor Noize returns to Casper again this year! First show today. Time: 10:00am. Doctor Noize returns to the Casper YMCA for the second year in a row! Time: 11:00am. Doctor Noize returns to Thornton for an Unplugged Show! Time: 10:30am. The Doc returns to beautiful Lincoln Center in Fort Collins! We’ll be handing out instruments again this year for the kids to play on the Grand Finale! Time: 11:00am. Doctor Noize returns to Keystone for his annual summer show in the mountains! Time: 11:00am. Dr. Noize emcees this 3-hour Discover Summer kickoff from the Terrace Theater Stage. It’s a full scale city event with all kinds of musical and kid-friendly activities! Time: 10:00am. Doctor Noize kicks off the summer program at Koelbel Library with a full Doctor Noize Live show! Time: 11:00am. An Unplugged Show in beautiful Sausalito ends Doctor Noize’s self-imposed exile from the live stage to compose the symphony! Sunday 12/01/13	- Saturday 03/01/14	 Lone Tree, CO Composing Break! Doctor Noize has a reduced performing schedule this winter to focus on completing the scores for “Phineas McBoof Crashes The Symphony.” See our Kickstarter link on the Home Page, and thanks to you Noizemakers for helping make this happen! Time: 10:00am. Doctor Noize & the Lone Tree Symphony Orchestra perform “Phineas McBoof Crashes The Symphony” in this beautiful 500-seat concert hall in the Doc’s hometown. Time: 3:00pm. A second 30-minute show at this wonderful festival. Lots of great stuff for kids to do at the Kids Music Adventure too! Time: 12:00pm. A 30-minute Doctor Noize Live! Show at Fort Collins’ cool music festival. Time: 7:00pm. Doctor Noize returns to his home college town to play a full Doctor Noize Live! Show in Mitchell Park in Palo Alto at twilight. Time: 7:00pm. Back to the great city of Whitewater, one of the Doc’s favorite places to play! Time: 1:30pm. A songwriting workshop for the City Of Whitewater! We’ll write and record a song at this workshop, and then the workshop kids will perform the song with Doctor Noize at the summer concert that night! Time: 11:00am. A full live show at the beautiful Lincoln Center in Fort Collins! Time: 3:00pm. A full Doctor Noize Live! Show. Time: 1:00pm. A full Doctor Noize Live! Show. Time: 10:00am. A full Doctor Noize Live! Show. Time: 3:00pm. A Doctor Noize Unplugged Show. Time: 11:00am. Doctor Noize plays this gorgeous venue as part of the renowned Strings Music Festival in one of the world’s most beautiful places, Steamboat Springs! Everyone from Wynton Marsalis to Trout Fishing In America has played here recently. Don’t miss it! Time: 10:30am. Doctor Noize plays a Live! show at the Highlands Ranch Kidsfest. There will be all sorts of fun things for kids to do at one of the Denver Metro’s most beautiful parks. Time: 1:15pm. *Note the date change! * (This show was formerly scheduled for 4/13, but has been moved to 4/20.) A full Doctor Noize Live! show to celebrate National Bookmobile Day! Time: 4:00pm. Box office: 970-349-0619. Doctor Noize plays this beautiful ski resort town — renowned for its top-flight artists and music festivals from operatic to jazz — for the first time! Time: 1:00pm. Doctor Noize plays his first big show in Sitka, Alaska! Part of Sitka’s Arti Gras Festival. Awesome. Time: 1:00pm. “Doctor Noize Goes Bananas!” Symphony Show with the Bozeman Symphony under the baton of Guest Conductor Kyle Pickett. Time: 10:30am. “Doctor Noize Goes Bananas!” Symphony Show with the Bozeman Symphony under the baton of Guest Conductor Kyle Pickett. Time: 1:15pm. *Private Show* “Doctor Noize Goes Bananas!” Symphony Show for schools with the Bozeman Symphony under the baton of Guest Conductor Kyle Pickett. Time: 3:00pm. *Private Event* Doctor Noize rocks the Walsh triplets’ birthday party — superstars on the championship youth soccer team he coaches! Time: 6:00pm. This year’s evening show with the orchestra in Juneau! Last year we had a big percentage of the city attend. Looking forward to it! Time: 10:00am. *Private show* Dr. Noize returns to perform with the Juneau Symphony! This morning show is for schools only. Time: 3:00pm. Radio interview at Juneau’s NPR station about music, kids & the week’s shows! Time: 10:30am. *Private show* An Unplugged show! Time: 8:15am. Radio interview with Doctor Noize about music, kids & the upcoming shows! Time: 12:00pm. *Private show* Unplugged show! Time: 9:45am. *Private show* A full Doctor Noize Live! assembly show. Time: 5:00pm. A second day and a second show at Keystone’s mountain paradise! Time: 5:00pm. The Doc’s always played Keystone in the summer — now he’s partying up there in the winter too! Come have some fun after a day in the snow. Time: 1:00pm. New Year’s Show #2! Once again, the Doc is ringing in the New Year with two shows at the world’s largest children’s museum. Don’t miss it! Time: 12:00pm. New Year’s Show #1! Once again, the Doc is ringing in the New Year with two shows at the world’s largest children’s museum. Don’t miss it! Time: 10:00am. WORKSHOP: Create A Hit Song With Dr. Noize! The Doc’s annual songwriting workshop at the world’s largest children’s museum! Don’t miss this amazing place. Time: 12:15pm. *Private Event* The Doc has been invited back to play two sets at this big fun annual Christmas party, along with his good friend and acclaimed children’s musician Steve Weeks! Time: 10:45am. *Private Event* The Doc has been invited back to play two sets at this big fun annual Christmas party, along with his good friend and acclaimed children’s musician Steve Weeks! Thursday 10/04/12	- Friday 12/14/12	 Doctor Noize’s Studio Tour Break! Thursday 10/04/12	 Doctor Noize’s Studio Tour Break! The Doc ends 2012 with a tour break to hole up in his studio and start pre-production on some cool stuff. We’ll see you at the shows in 2013! Time: 12:30pm. An Unplugged show in Doctor Noize’s CA hometown downtown! Time: 1:00pm. *Private Event* Due to popular demand, a third orchestral show for families in Northern CA has been added to the tour. This is really inspiring to Dr. Noize. This is a show for schools throughout the area and is closed to the public. Time: 10:00am. The “Phineas McBoof Crashes The Symphony” public premiere tour with the North State Symphony continues! We expect another 1,000 at this show, so get your tickets before they sell out. One of Dr. Noize’s faves, Elvis Costello, plays here a few days earlier. Go see him too! Time: 11:30am. The public world premiere of “Phineas McBoof Crashes the Symphony” with the North State Symphony at Chico State University! See Dr. Noize’s family concert opera that drew raves at its private premiere in May. We expect about 1,000 students, teachers and parents at this show, so get your tickets early. *PRIVATE EVENT* Another day of rockin’ workships with the students at Redding School of the Arts!! *PRIVATE EVENT* Doctor Noize workshop with the students at Redding School of the Arts! Time: 12:00pm. Doctor Noize returns to Seattle for a great outdoor event. Also performing at 1 PM is one of the hottest kids’ bands in the universe, Seattle’s own Recess Monkey! Double the awesome. Time: 6:00pm. The Doc’s excited to play Longmont’s big festival! Time: 4:00pm. Dr. Noize plays the annual Taste Of Lone Tree Festival! Come to the Taste Of Lone Tree for great food, art & activities — and catch a Dr. Noize show while you’re there for a great all-around day. Time: 12:00pm. Doctor Noize headlines the Bohemian Nights family stage for the fifth year in a row! Come spend the whole day at this amazing free festival, with tons of bands and all sorts of rides and activities for kids. Time: 3:00pm. Doctor Noize is headed back to the Meadows Library for an unplugged show come hang out with Doctor Noize in Boulder! Time: 11:00am. Doctor Noize unplugged in beautiful Boulder Colorado! Time: 7:00pm. Doctor Noize heads back to The Englewood Library KidStage for a full outdoor show! Time: 10:00am. Doctor Noize plays the Teddy Bear Picnic in the park for the city’s 20th anniversary! Time: 6:30pm. Address: 333 E. Church St.. Dr. Noize is honored to play a Giving Back Show celebrating the lives and memory of two wonderful boys, Treyton Kilar and Connor Bourke. Tonight we’ll be raising money for Treyton’s Field of Dreams and Connor’s Memorial Playground, two community projects that will allow kids for years to come to enjoy the things Treyton and Connor enjoyed. Time: 7:00pm. Age restrictions: All Ages. Doctor Noize is back again to play at the Whitewater summer concert series! Come hang out and have some fun in the summer sun! Time: 11:00am. A second show in radtastic Phoenix, Arizona! Time: 10:00am. Doctor Noize heads to Phoenix to put on a rockin’ summer show! Time: 6:00pm. *WORLD PREMIERE* of Doctor Noize’s “Phineas McBoof Crashes The Symphony”! This full-length (45-60 minute) family orchestral work was commissioned by the North State Symphony and Redding School of the Arts. We will premiere it tonight with the North State Symphony under conductor Kyle Pickett, then perform it with other orchestras and record it as the 3rd Doctor Noize album for Fall 2012 Release! Time: 9:45am. Doctor Noize does a Create-A-Song Workshop for Wellness! Time: 3:30pm. TRIPLE RELEASE PARTY!!! Come celebrate the release of “The Return of Phineas McBoof” book and CD and “Grammaropolis”!!! Time: 11:00am. Doctor Noize returns to one of the most beautiful spots in the world for a childrens’ museum! *PRIVATE EVENT* The first of two Assembly Showz at the fantabulous Harker School. Back in his teaching days, Doctor Noize taught with several of the teachers at this school. *PRIVATE EVENT* The second of two Assembly Showz at Harker! Time: 10:00am. Doctor Noize is playing an unplugged show for the students at Swigert McAuliffe International School in Denver! Time: 6:00pm. Age restrictions: All Ages. Doctor Noize plays his second “Phineas McBoof Crashes the Symphony” show! This show will be open to the public!! Time: 10:00am. Age restrictions: All Ages. *PRIVATE EVENT* Doctor Noize heads to Alaska for a “Phineas McBoof Crashes The Symphony” show! Time: 1:00pm. *Private Event* Doctor Noize returns to Anthem Ranch for more fun bringing three generations together. Time: 1:55pm. Age restrictions: All Ages. Countdown to 2012 with Doctor Noize Live! Time: 12:55pm. Age restrictions: All Ages. Come enjoy the New Year with a little Doctor Noize Live at the Children’s Museum of Indianapolis! Time: 11:55am. Age restrictions: All Ages. Doctor Noize Live! Bringing in the New Year at the Children’s Museum of Indianapolis! Time: 10:00am. Age restrictions: All Ages. Come Create A Hit Countdown Song with Doctor Noize to welcome in the New Year! Time: 4:00pm. Dr. Noize returns to Smoky Hill for an Unplugged Show! Time: 5:30pm. *Private Event* Doctor Noize plays a private event at this renowned rock and roll museum in Seattle. Time: 1:30pm. Admission: $12.00. Age restrictions: All Ages. Doctor Noize is coming to The Vera Project for a Giving Back Show! Proceeds from the show will benefit the Leukemia and Lymphoma Society!! Come have a good time for a great cause!! Time: 2:00pm. A full Doctor Noize Live! show heading into the holidays in Indianapolis! Time: 11:00am. Dr. Noize returns to this stunning new facility to play a show! Time: 2:00pm. A second show at the Children’s Theatre! Details forthcoming. Time: 3:30pm. The Doc returns for another Unplugged Show and Book Reading at this great library during! The Cubberley Community Center is the temporary home of the Mitchell Park Library. Time: 10:50am. Doctor Noize finishes up his three day stay doing workshops with the students at Redding School of the Arts! Time: 8:45am. Doctor Noize is headed to the Evergreen Middle School to play a private assembly show! Time: 10:50am. Doctor Noize doing s’more workshops with the students at Redding School of the Arts! A residency at the Redding School of the Arts. Workshops, Showz, the works. The kids and I are gonna party in all sorts of creative wayz. Time: 10:50am. Doctor Noize is heading to Redding School of The Arts to do private workshops with the students! Time: 9:15am. Doctor Noize is heading to the Evergreen schools in Cottonwood, CA to play private assembly shows! Doctor Noize plays the grand opening family show at this incredible new performing arts facility in his hometown! Time TBD. A second show at the beautiful new Lone Tree Performing Arts Center! Time TBD. Time: 12:00pm. Update!!! This show is right next to the Aquarium! Directly South of the Aquarium! A return to Seattle, this time right at the piers for the Noon Tunes Concerts For Kids summer concert series! Time: 4:30pm. The Doc returns to headline the Kids Music Adventure at this amazing Fort Collins music festival. Rides, activities, and TONS of great bands! Time: 3:00pm. Another full Doctor Noize Live! Show in the Sunburst Atrium. See above for all the FREE DOCTOR NOIZE STUFF being given away at these Showz! Time: 1:30pm. A full Doctor Noize Live! Show in the Sunburst Atrium. See above for all the FREE DOCTOR NOIZE STUFF being given away at these Showz! Time: 10:30am. Doctor Noize returns for his annual residency at the world’s largest children’s museum. We start with a Genius Camp Song Workshop — FREE and open to the public! The Museum is giving away TWO IPADS with the Dr. Noize App and A BUNCH OF FREE DOCTOR NOIZE BOOKS AND CD’S at today’s Workshopz and Showz! Time: 2:00pm. Summer bash in Parker! Time: 11:00am. The annual Rocky Mountains show in Keystone! Always a party — beautiful place, beautiful stage, face painting, mountain fun galore. See ya there. Time: 2:15pm. A full Doctor Noize Live! Show for Redwood City’s Target Family Days! Hear the music and play at the Doctor Noize Creation Station! Event also features Street Performers, Cooking Demonstrations, Themed Face Painting, Hands-on Art Projects, Food, Bounce Houses and more. Time: 1:00pm. An Unplugged Show for Redwood City’s Target Family Days! Hear the music and play at the Doctor Noize Creation Station! Event also features Street Performers, Cooking Demonstrations, Themed Face Painting, Hands-on Art Projects, Food, Bounce Houses and more. Time: 1:00pm. Music Adventure Day at Blank Park Zoo! Doctor Noize playes Des Moines for the first time! Time: 5:15pm. Doc rocks the Rocky Mountain Freedom Fest for the second day running! Come sing and dance to the music and play at our Creation Station — Doctor Noize iPad games and videoz, coloring stations, signed books and CD’s. Time: 5:30pm. Doc rocks the Rocky Mountain Freedom Fest! Come sing and dance to the music and play at our Creation Station — Doctor Noize iPad games and videoz, coloring stations, signed books and CD’s. Time: 11:00am. An Unplugged Show! Time: 2:00pm. The Doc returns to the Bemis Library for an Unplugged Show & Book Reading. Time: 7:00pm. Doctor Noize returns for a third time to rock with his friends in the great college and family town of Whitewater! Time: 11:45am. *Private Event! * A full Doctor Noize Live! show for Math Field Day for Los Angeles County Office of Education. Time: 3:00pm. *Open To The Public! * A full Doctor Noize Live! Giving Back Show in the heart of LA. FREE to the public — a large portion of product sales (and donations) go straight to this school that’s working hard to bring art and music to kids who may not usually get to see a lot of it. Time: 11:30am. Admission: $4.00. Box office: (530) 898-6333. Doctor Noize returns to play family showz with the Symphony at Chico State’s beautiful Laxson Auditorium. So rad. Don’t miss it! Time: 10:45am. Admission: $4.00. Box office: (530) 243-8877. Doctor Noize returns to the Cascade Theatre in Redding with the symphony for more orchestral family mayhem! Time: 11:00am. *Private* An assembly show for the Redding School of the Arts. Time: 10:30am. *Private Event! * Join Dr. Noize and the Easter Bunny for a day of music, games, face painting and fun for members of this beautiful community. Time: 11:00am. A public show for the Douglas County Early Childhood Coalition at one of Doctor Noize’s favorite joints, the beautiful Wildlife Experience museum! Time: 3:00pm. A third show for the city of Palo Alto! Party on, Palo Alto! More info as the date approaches. Time: 1:00pm. Address: 1455 Madison Ave.. A public show sponsored by the amazing Bay Area organization, Music For Minors. I still remember MFM events I attended as a Bay Area kid! Details forthcoming. Time: 1:30pm. *Private Event* A show and workshop for this great school, sponsored by Music For Minors! Time: 8:40am. *Private Event* Doctor Noize conducts an in-school Genius Camp Assembly Workshop sponsored by Music For Minors. Time: 2:00pm. A second show for the city of Palo Alto and its school kids. More info as the date approaches. Time: 10:00am. A return to play for the City Of Palo Alto and school kids there. More info as the date approaches. Time: 10:00am. The first stop on Doctor Noize’s 2011 Northwest Tour! A beautiful theater near the great college town of Eugene. Time: 2:00pm. A full show with all the instrumentz & toyz! Time: 11:00am. Doctor Noize’s first visit to the Portland metro! A full show! Time: 3:00pm. Doctor Noize plays his first shows in Asia next month! So fun. This show’s at the amazing Cyberport hi-tech center. Time: 4:30pm. Admission: $60 Hong Kong Dollars. Age restrictions: All Ages. *GIVING BACK SHOW* Dr. Noize teams up with Hong Kong’s premiere children’s arts center for a full Doctor Noize Live! show and a book reading. All proceeds go to Hong Kong’s “Bring Me A Book” non-profit foundation. Time: 6:30pm. Admission: $150. *SOLD OUT! * Doctor Noize is a featured speaker on music education at the Music For Minors Mardi Gras Mystique fundraiser! Tickets support music education for Bay Area students. Time: 12:30pm. *School Assembly Show* An Unplugged Show for this great Boulder school. Time: 11:30am. *Private Event* Doctor Noize plays for Encana Energy’s holiday bash again this year! Time: 11:00am. *Private Show! * A full show by Doctor Noize and lots of family fun await families at this holiday event. Time: 10:00am. The Doc kicks off his own birthday with this annual Fall Family Festival! See the show, then enjoy all the fun family activities there. Time: 2:30pm. Show #2! Different songs but the same crazy party. Time: 1:00pm. The Doc returns to this huge and fantastically fun place in Silicon Valley. Time: 4:30pm. This show is FREE and open to the public with advance registration — click the link above to quickly register! Time: 10:30am. A Grade 3-6 assembly show at the same California Distinguished School. Do not throw tomatoes at the Principal as he croons onstage with Dr. Noize. Time: 9:00am. A K-2 assembly show for the great Principal Skip Johnson, who Doctor Noize has known as an educator for over twenty years! Time: 3:00pm. Doctor Noize rocks a show right on LA’s famed Wilshire Blvd. at the Zimmer — winner of “Best Museum” by Nickelodeon’s “Go City Kids” Parents Guide. Time: 10:15am. Doctor Noize kicks off this historic LA museum’s biggest event of the year! Time: 3:00pm. Doctor Noize rocks this giant museum on Target Free Day. In other words — come one, come all, it’s FREE!!! And a really cool artsy kids’ museum to boot. Time: 4:00pm. *Private Event! * Kiran’s Totally Rad Rockin’ Birthday Rager. (Venue not to be confused with “House Of Pain.”) When Dr. Noize’s Main Man Kiran throws a party, Dr. Noize goes. Time: 6:15pm. A second Unplugged Show at Denver’s big bash. Time: 3:15pm. An Unplugged Show (guitar and voice only) at Denver’s giant end-of-summer bash, attracting over 500,000 people each year! Time: 6:30pm. Doctor Noize plays a special show in his hometown on “Big Screen on the Bluffs” Outdoor Family Movie Night. Music, crafts, face painting, and a movie starting at dusk! Time: 3:00pm. *Private Event* Doctor Noize rocks the summer Amgen corporate party. Time: 3:30pm. A second show at the Rocky Mountain Hospital For Children’s Grand Opening! Time: 2:00pm. The grand opening of the new children’s hospital, with kids’ activities, face painting, Jack The Otter mascot, and lots of entertainment. Time: 4:30pm. Doctor Noize returns again to headline the Children’s Stage at Colorado’s grand music festival in Fort Collins. Earth, Wind & Fire headlines the adult stage later on that evening. Time: 4:00pm. The Doc AND HIS KIDS are guests for a full hour on “The Kids Show” this weekend. Click the link above to listen live online! Time: 2:00pm. The Doc returns to the Kiwanis Club’s “Fish Upon A Star” event. Entertainment, games, face painting, prizes & more. 1-5pm. Donations benefit the Kiwanis “Stars of Tomorrow” Show. Time: 10:00am. *Private Event! * Doctor Noize celebrates Grandkids’ Day with a full show in this beautiful community. Time: 7:30pm. *Members Only Show*… A second show at the incredible Tech Museum of innovation in Silicon Valley. Time: 6:30pm. *Members Only Show* at the incredible Tech Museum of innovation in Silicon Valley! Time: 12:30pm. *Private Show* A show for the great kids at this incredible children’s hospital. Time: 6:00pm. *Private Event* Dr. Noize returns again to the Yahoo! campus to rock their annual Family Fun Day. Can you, uh, yahoo?!? Time: 3:30pm. A full Doctor Noize Live! show, including the live performance debut of the dinosaur song we wrote earlier in the afternoon! Time: 1:30pm. A songwriting workshop with Dr. Noize! We’re writing & recording a song about dinosaurs for the museum’s dinosaur exhibit. Get on the recording! Time: 11:00am. Admission: Free!. Back to Keystone Resort for their biggest summer family event of the year. On the main stage in the beautiful outdoors in the mountains. Enjoy the whole day! Time: 7:00pm. Doctor Noize has already been invited back by my friends in Whitewater to play their Independence Day Kickoff! I look forward to seeing you all again! Time: 4:00pm. *Private Show! * Doctor Noize rocks Parker’s Birthday Bash for his friends the Bells. Time: 2:00pm. *Private event* A full show for many generations at this great community’s grandkids’ day! Even better: A crazy balloon lady is gonna be there. Time: 1:30pm. A second big loud Doctor Noize Live! show fully loaded with the Doc’s big collection of instruments and whatchamagadgetz. Time: 11:00am. A full Doctor Noize Live! show — with the Doc’s full collection of instruments and whatchamagadgetz — in the Sunburst Atrium! Time: 1:30pm. A third Create A Hit Song With Doctor Noize! workshop. Time: 10:30am. A Book Reading & Acoustic Mini Concert in the Sunburst Atrium. Time: 3:15pm. Create A Hit Song With Dr. Noize! A second songwriting seminar at the great Indy Children’s Museum. Time: 1:30pm. Create A Hit Song With Dr. Noize! songwriting seminar. Dr. Noize continues his multi-year collaboration with the world’s largest children’s museum. Time: 7:00pm. Doctor Noize’s first trip to Whitewater — a summer outdoor concert series by the lake. Time: 2:30pm. A return to see the Doc’s friends at the Sun Prairie Library in beautiful Sun Prairie, WI. Time: 6:00pm. *Private Event* Doc rocks a full show IN THE IMAX THEATRE for the families of Children’s Choice & Riverstone schools! We expect to fill the house; exact showtime TBD. Time: 10:00am. Dr. Noize kicks off the library’s 2010 Summer Reading Program with a full size live show! Time: 12:00pm. Doctor Noize rocks Palo Alto with a full show at the Children’s Theatre! A new venue for the Doc in his college hometown. Time: 3:30pm. An Acoustic Mini Concert & Book Reading in Dr. Noize’s college hometown! Time: 11:00am. An Acoustic Mini Concert & Book Reading in Boulder. Their website says STEVE AUSTIN is the Branch Manager. Could it be… THE Six Million Dollar Man? Time: 11:00am. A Doctor Noize Lite! family show in Boulder. There is a cool brunch before the show too. Time: 1:00pm. *Private event! * The Doc rocks with Encana Energy at the Hyatt Regency in Denver. Time: 2:00pm. A Doctor Noize Lite! show at this library in Littleton. Come have fun! Time: 9:45am. A school assembly show for grades K-6 at the great Eagle Ridge Elementary! Time: 2:30pm. Dr. Noize has been invited to kick off the grand opening of the beautiful new 30,000 square foot Lafayette Library! A Doctor Noize Lite! show. Time: 2:00pm. The University of Denver’s Homecoming Weekend includes the family oriented Boo Bash! Doctor Noize will be practicing his crazy/scary laugh. Time: 4:30pm. Hello Reno! This is a Giving Back charity show. All proceeds go to the Food Bank of Northern Nevada. Time: 4:00pm. A second show in at Tateuchi Concert Hall in Mountain View. Come one come all! Sing and dance in this beautiful theater. Time: 2:00pm. Doctor Noize returns to beautiful Tateuchi Hall, this time as part of the CSMA Performances series. Time: 6:30am. The Doc’s on the NBC morning show in Reno, playing a song and promoting the upcoming Reno Giving Back Show for the Food Bank of Northern Nevada. Time: 10:00am. Dr. Noize performs at the Cascade Theatre. A second orchestral concert, in a second city. There will be more in the future! Time: 11:30am. Dr. Noize performs a family orchestral concert at Laxson Auditorium with Maestro Kyle Pickett and the orchestra. Donâ€™t miss it! Time: 1:30pm. *Private Event! * Doctor Noize parties it up with an acoustic show for Cannon, Cole and their buddies. Time: 10:30am. *Private Event! * My daughter Sidney has requested a “Create A Hit Song With Doctor Noize” workshop for her friends for her birthday. Time: 11:00am. Admission: $20 suggested family donation. An Acoustic Mini Concert & Book Reading at the Student Center. Proceeds benefit The Literacy Coalition of Colorado. Time: 10:00am. Part of this cityâ€™s fantastically produced concert series in the beautiful D.L. Parsons Theatre. A great place to see a show! Time: 1:00pm. Just added! A show for the Kiwanis Club of Fort Collins. A kids festival that may become an annual event! Time: 1:00pm. Back to the the Main Street Outdoor Festival Stage of River Run Village. Come at noon to see a great magician first! Also enjoy bounce houses, carnival games and dancers. Time: 10:30am. A return to the Eugene Field Library, this time for a book reading and acoustic mini concert! Time: 4:30pm. Dr. Noize headlines the Kids Music Adventure stage again at this huge music festival. Kidsâ€™ activities galore! Time: 10:30am. Rumor has it that this concert series at the Thornton Community Center is nothing short of funtaztik. Yezzz!!! Time: 5:00pm. Admission: Private Event. Doctor Noize rocks the Ranch. Time: 10:00am. Doctor Noize opens Kids Day At The Fair! Time: 4:00pm. A full instrument Doctor Noize Live! show â€” the first full show in Utah! Time: 2:00pm. Songwriting workshop! Weâ€™ll write a song about frogs for the museumâ€™s Toadally Frogs! exhibit. Time: 6:00pm. Admission: Private Event. A birthday show for one of Salt Lake Cityâ€™s hippest kids in beautiful Park City. Time: 10:00am. A full Doctor Noize Live! show followed by a 15 minute audience interactive loop jam. Wowza. Time: 2:00pm. Come kick off the Grand Opening Weekend of this brand new community center, shopping center and library. Time: 4:00pm. Admission: Private Event. Doctor Noize parties it up at the headquarters of Yahoo! with Andy Z & thousands of fine folks at Yahoo! Time: 12:00pm. The big debut of the Dr. Noize Lite! program at this fantastic South Bay venue that Dr. Noizeâ€™s kidz love! Time: 6:00pm. Dr. Noize performs at the Main Street Outdoor Festival Stage of River Run Village. Also enjoy bounce houses, carnival games and dancers on a beautiful summer night in this mountain resort town.